In this second part of the book, more characters get introduced and are given shape - such as the Ocean Princess, Poonkuzhali, who is a tremendous help to both Vandiya Devan and the young Prince, Arulmozhi Varma. As Sundara Chozha physically deteriorates, his mind plagues him with fears and superstitious beliefs in spells and curses. His past is unraveled and many of the mysteries surrounding the first part of the book come to light. As the plot unfurls, the suspense heightens and brings with it more mysteries. Since India is steeped in its beliefs and fears on witchcraft and sorcery, this story too abounds with it. When elements of supposed black-magic get added to a political drama, the whole story is filled with different dimensions of enigma. But, this volume of the book seems to directly and indirectly point to the truth and the answers to the mysteries. The story by itself doesn’t develop much, but Kalki has taken the time to define the characters in view of their past and present circumstances. 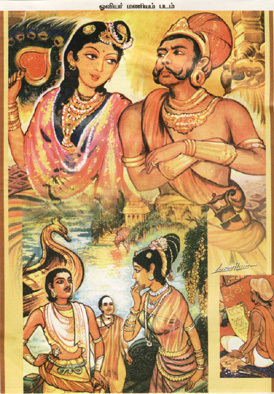 The book begins with the start of Vandiya Devan’s journey to Srilanka to deliver a message to the young Prince. Once in Srilanka, Vandiya Devan and the prince strike a bond of friendship. The story paints Arulmozhi Varma’s generous and virtuous spirit, thus glorifying the young Prince in the reader’s eyes. Once the conspiracies come to the open, the characters jump into action mode. Evading more threats to their lives, the Prince and Vandiya Devan brave a violent storm in the middle of the ocean and try to get to the Tamil shores to meet the dying Emperor and handle the brewing political storm.